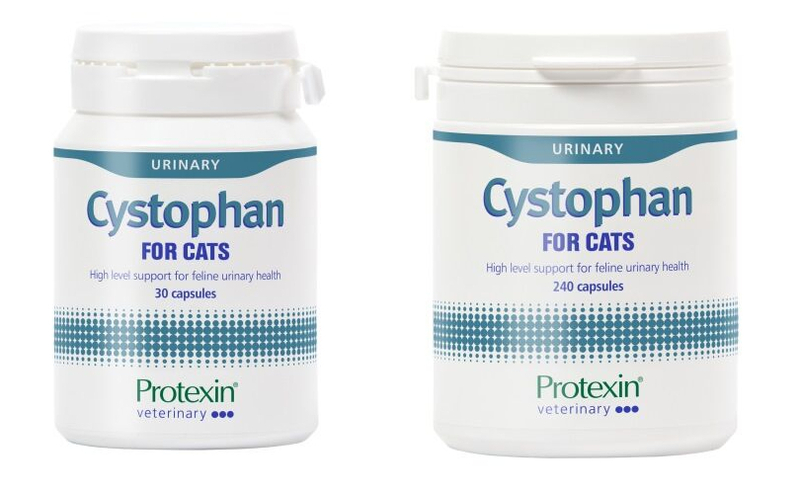 Cystophan is manufactured by Protexin and is used to treat bladder disease in cats. Cystophan contains glucosamine, hyaluronic acid and tryptophan in forms which are believed to be particularly helpful in protecting the bladder wall. It also has a tempting chicken flavour to make it palatable to cats. Below are some recent questions we've received regarding Cystophan Sprinkle Capsules for Cats, including answers from our team. The ingredients in Cystophan are N acetyl D glucosamine, L tryptophan, Hyaluronic acid, Artificial chicken flavouring, Magnesium stearate. So as far as I can see does not contain any yeast. As far as I am aware it does not contain any Chondroitin. Hello, my elderly cat who is 19 and a half years old has high thyroidism, high blood pressure and his kidneys are not working so well and he suffers from cystitis from time to time and he has a touch of this now. I was wondering if this product would be suitable for him? Kind Regards. This would be an ideal supplement for your cat if he is prone to getting cystitis. It is intended to be given daily long term which I would recommend in your cats case. It is generally a safe supplement and should not have any adverse effects on his blood pressure, hyperthyroidism or kidneys. My cat has idiopathic cystitis and he takes this for 5 weeks. For the first two week, he takes twice daily and then once daily, but still has no improvement. How much time it needs to have effect on my cat or should I try other product such as Feliway Cystease. The Cystophan should really be have some effect by now. Changing to Feliway Cystease may help but using supplements such as these is only one of the things you can do to help prevent idiopathic cystitis. Dilute urine is the key to preventing it so feeding wet food rather than dry food and leaving bowls of water on various window sills may tempt your cat to drink more. Urine is often more concentrated when a cat is fed on dry food. Overweight cats are also more prone to cystitis so feeding a suitable low calorie food to reduce your cats weight would be helpful if there is a problem here. Stress can also be a trigger. If your cats seems stressed you could try a feliway diffuser which releases calm inducing pheromones undetectable to people. Well it is safe to give this product for life - that is what is often required. That might not be the only or best way of dealing with the problem, but it is a possibility. The symptoms you describe are common in cats which are "stressed" and the mosts stressful thing to a cat is generally another cat. A small number of cats enjoy the company of other cats, most tolerate them and some find it very difficult to cope at all with others being around. Personally I would certainly try a Feliway Diffuser in the main living area, possibly other rooms as well. If you are not familiar these release a scent into the air which humans cannot detect but which has a pronounced calming effect on cats usually (a synthetic pheromone). You should also give some thought to enabling your cats to live as separately as possible, with different feeding, sleeping and toileting areas. They might well learn to "miss" each other a lot more in their daily routines, so reducing the stress of coming into contact. Been looking for treatment for my dog as she has a urine infection and this keeps coming up on Google. Is it safe to use on a dog at all? This is safe for dogs but is unlikely to be effective. There is a particular type of cystitis which occurs commonly in cats which can respond to this medication. The cystitis which dogs get is different and less likely to respond. Your dog might benefit from having Urinaid or perhaps Canine Cystaid. Personally I would try Urinaid, while encouraging fluid intake. Ideally stop dried food as well, so that more liquid is taken in with the food. This all helps to flush out the bladder and aids bladder health.Going for frequent short walks also helps, because the dog is encouraged to empty the bladder more often. Sitting around for many hours with a full bladder is something many dogs are able to do, but it makes them a bit more prone to trouble. 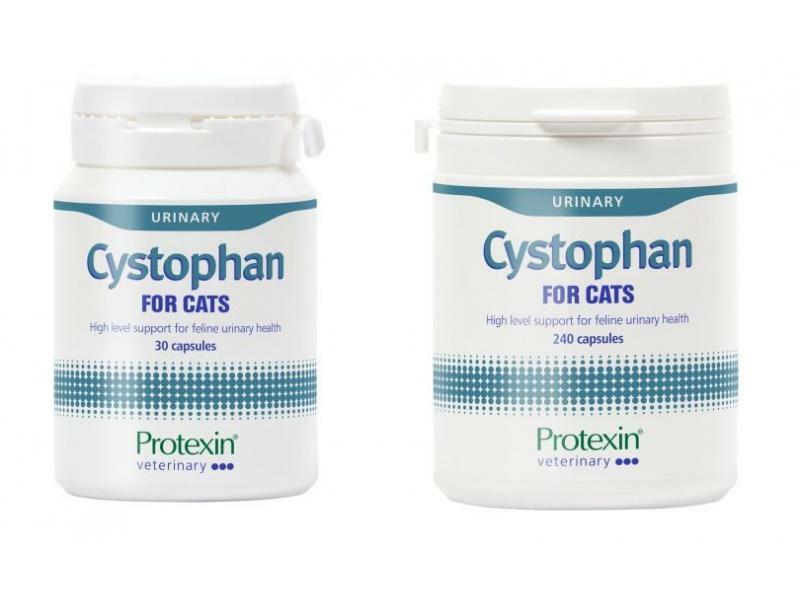 Please can you advise how long it's safe for my cat to take cystophan. He's recently suffered from his first bout of urinary tract infection and is now thankfully symptom free. I'm still giving him one capsule daily and wondered if I should continue to do so for life? Cystophan is intended to be given long-term and it is OK to give it for life. Having said that, it is difficult to be sure if that is really required. Some cats do get this form of cystitis regularly and repeatedly if they are not on treatment. It can be painful and distressing and so should be prevented if possible. Other cats might only get cystitis once in their life, or once every few years, so it might not be sensible to embark on daily medication life-long after one episode. There are a number of other risk factors for the idiopathic cystitis which this product is used for. These include eating mostly dried food, obesity and leading a very sedentary lifestyle. It is also more common in young cats than older cats. Personally I would use Cystophan for 3 months while trying to do what I could to improve the other factors, then I would stop. Obviously this increases risks of the problem returning, but on balance seems sensible. Try to increase your cat's water intake by using plenty of moist foods and offering water in places away from where you feed him (some cats seem to dislike drinking where they eat). A full glass of water placed on one or two windowsills will often tempt cats to drink, as will a cat water fountain. If your cat is plump, reduce the amount of food offered - it is healthy to be hungry sometimes! Offering limitless amounts of very tasty food is really a recipe for obesity, though we often do it for our cats. There are also special foods which reduce the chances of cystitis happening, such as Hills s/d prescription diet. You could ask your vet about this too.